Creating a Zoe is easy. You simply choose from the available images and rearrange them in order you like. Themes and soundtracks are available in case you want to be truly creative. Once finished editing, you can easily share Zoes. Zoe also allows you to collaborate with friends on the same project. You can send requests and combine your media content into the same Zoe. The app doesn't work in certain locations. In some countries it's still listed as Coming soon but it worked when we tested it from the US. The display on the HTC One mini 2 is more than adequate in both size and quality to allow for enjoyable image consumption. The video player on the HTC One mini 2 has a rather simple interface. There isn't a dedicated app - you just pick a video from the gallery. The HTC One mini 2 video player had somewhat spotty video codec support. It managed to play one or two DivX videos but didn't play five others. MKV files on the other hand weren't a problem all the way up to 1080p. WMV videos were trouble-free as well. XVID played almost every time but had issues with the sound coded (AAC), which otherwise played on other videos. 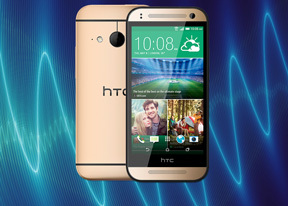 The HTC Sense 6 music player features similar layout as the one in the previous version. The flattened interface design however makes the setup look fresh. There's no equalizer on board. You have the option to toggle Boomsound audio on or off when you have the headphones plugged in. Like we mentioned already, you cannot disable the feature when playing through the speakers. The FM Radio is aboard with RDS support. It automatically saved the available stations and has one of the simplest interfaces we've seen. There are play controls - play, stop, skip and a loudspeaker option. To say that HTC is doing well with the audio output of its smartphones would be a massive understatement. The company is not only consistently delivering devices that set the benchmarks for audio quality, but it's somehow managing to beat its own high standards with each new generation. Had the One mini 2 matched the results of its bigger brother, the One (M8), we would be perfectly happy with it and pronounced it the best musician in the mini league. However, the smartphone goes a step further and delivers even cleaner output than the flagship. The perfect performance with headphones is now par for the course, but this is the first handset we see to be just as good when we plugged in a pair of headphones. Not even the spike in stereo crosstalk that we've come to expect from every smartphone appeared - it does better than what most phone manage to output without any resistance applied to their line-outs. 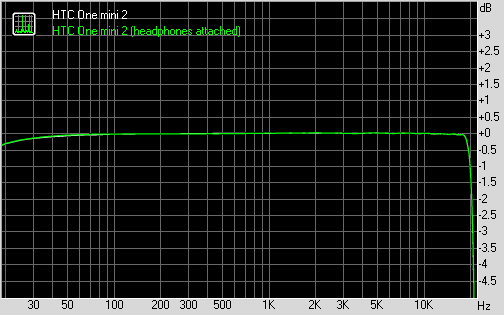 The HTC One mini 2 delivers on the loudness side, too. Through its audio jack it's only a tad quieter than the One (M8), but both are so good that the difference barely matters at that point.